Note: For current weather reports, see the bottom of this page! The climate in Austria is widely continental with the Eastern edge of the country stretching into the Pannonian climate zone. It is typical for Central Europe with cold winters (going down to minus 20 degrees Celsius during the night) and hot and sunny summers (going up to 35 degrees Celsius during some days in August). For Americans: this means that winter lows and summer highs range from about 0 to 100 degrees Fahrenheit. The coldest months are January and February, the hottest July and August. The Alps divide Austria into at least four areas with distinct local climates. The alpine area in the West of the country has a generally harsher climate. The valleys of Tyrol, especially around Innsbruck, are famous for the "Föhn" winds. These warm winds can rapidly increase the temperature, but also cause headaches and can trigger migraine. Rain is more common in the Alps and temperatures are lower. Generally, the Austrian Alps are colder than the Western Alps in Switzerland or France. The North of the country has a typical continental climate. Because clouds from Germany often get "stuck" in the airflow around the Alps, rain is more common North of the mountains in Salzburg, Upper Austria and the West of Lower Austria. Salzburg is famous for its "Schnürlregen" ("rain in strings"), steady and continuous rain that can go on for days and days. 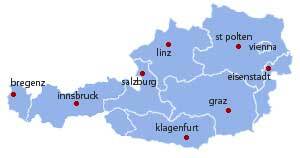 The region of the eastern parts of Lower Austria, Vienna and the Burgenland are influenced by the weather of southern Russia and Eastern Europe. This "Panonnian" climate is considerably milder than the one in the mountains or Upper Austria and makes great weather for raising wine. This applies also to the fourth region, the area south of the Alps in Eastern Carinthia and Styria, where the weather is mild and the summers are pleasant - influenced by Mediterranean climate systems. The question of when to go depends on what you want to do, really. Skiing is recommended from between Christmas and New Year′s Eve (this is also the time at which many Austrians join the tourists on the slopes), as well as from late January to late March. This is the main season, when prices and ski traffic are high. The low season runs in good years from as early as early November until Christmas, the early weeks of January and from late March until end of April. Especially during low season you can possibly encounter snow-less mountains in warm years, so if you are a last minute person, it′s worth checking the snow situation before heading off. The warm and pleasant summer months range from May to September with the summer peak in July and August. You can get warm and sunny days in April and October, as well as miserably cold and rainy ones during the summer, but there′s always an element of risk with the weather in Austria. My personal recommendation for sightseeing and outdoors things (hiking, national parks, sports) would be the months May and September - relatively few tourists, low airfares and other prices, and the weather is already or still pleasant. Whatever you do, dress in layers. Goretex jackets with removable fleece are very popular among Austrians, and there′s a reason for that. Jackets of this kind will also prove to be useful when it comes to hiking: alpine terrain can be chilly even during the hottest summer days. Recording the weather, by the way, is a business with tradition in Austria. 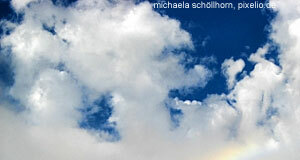 Detailed meteorological surveys and measurements are made and archived since the 17th century. The summer of 2003 was the hottest ever measured - so far.